Asia (/ˈeɪʒə, ˈeɪʃə/ ( listen)) is Earth's largest and most populous continent, located primarily in the Eastern and Northern Hemispheres. It shares the continental landmass of Eurasia with the continent of Europe and the continental landmass of Afro-Eurasia with both Europe and Africa. 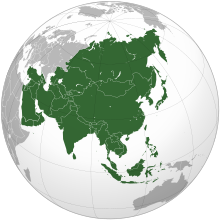 Asia covers an area of 44,579,000 square kilometres (17,212,000 sq mi), about 30% of Earth's total land area and 8.7% of the Earth's total surface area. The continent, which has long been home to the majority of the human population, was the site of many of the first civilizations. Asia is notable for not only its overall large size and population, but also dense and large settlements, as well as vast barely populated regions. Its 4.5 billion people () constitute roughly 60% of the world's population. The Ratchaprasong and Sukhumvit skylines of Bangkok, the capital of and largest city in Thailand, with Lumphini Park in the center, as viewed from the Sathon District. Known in Thai as Krung Thep ("city of angels"), it became the capital in 1768 after the destruction of Ayutthaya by Burmese invaders. Geisha are traditional Japanese artist-entertainers. Geisha were very common in the 18th and 19th centuries, and are still in existence today, although their numbers are dwindling. Geisha take lessons in several arts forms for most of their lives, not for just entertaining customers but for a lifetime of learning. Ban Ki-moon is the eighth and current Secretary-General of the United Nations, after succeeding Kofi Annan in 2007. Before going on to be Secretary-General, Ban was a career diplomat in South Korea's Ministry of Foreign Affairs and in the United Nations. He entered diplomatic service the year he graduated from university, accepting his first post in New Delhi, India. In the foreign ministry he established a reputation for modesty and competence. Ban was the Foreign Minister of the Republic of Korea from January 2004 to November 2006. In February 2006, he began to campaign for the office of Secretary-General. Ban was initially considered to be a long shot for the office. As foreign minister of South Korea, however, he was able to travel to all of the countries that were members of the United Nations Security Council, a maneuver that turned him into the front runner. On 13 October 2006, he was elected to be the eighth Secretary-General by the United Nations General Assembly and officially succeeded Annan on 1 January 2007. Ban has led several major reforms regarding peacekeeping and UN employment practices. Diplomatically, Ban has taken particularly strong views on Darfur, where he helped persuade Sudanese President Omar al-Bashir to allow peacekeeping troops to enter Sudan; and on global warming, pressing the issue repeatedly with former U.S. President George W. Bush. Ban has received strong criticism from OIOS, the UN internal audit unit, stating that the secretariat, under Ban's leadership, is "drifting into irrelevance". Saffron is a spice derived from the flower of Crocus sativus, commonly known as the saffron crocus. Crocus is a genus in the family Iridaceae. Each saffron crocus grows to 20–30 cm (8–12 in) and bears up to four flowers, each with three vivid crimson stigmas, which are each the distal end of a carpel. Together with the styles, or stalks that connect the stigmas to their host plant, the dried stigmas are used mainly in various cuisines as a seasoning and colouring agent. Saffron, long among the world's most costly spices by weight, is native to Southwest Asia and was first cultivated in Greece. As a genetically monomorphic clone, it was slowly propagated throughout much of Eurasia and was later brought to parts of North Africa, North America, and Oceania. The saffron crocus, unknown in the wild, likely descends from Crocus cartwrightianus, which originated in Crete or Central Asia; C. thomasii and C. pallasii are other possible precursors. The saffron crocus is a triploid that is "self-incompatible" and male sterile; it undergoes aberrant meiosis and is hence incapable of independent sexual reproduction—all propagation is by vegetative multiplication via manual "divide-and-set" of a starter clone or by interspecific hybridisation. If C. sativus is a mutant form of C. cartwrightianus, then it may have emerged via plant breeding, which would have selected for elongated stigmas, in late Bronze-Age Crete.Saffron's bitter taste and iodoform- or hay-like fragrance result from the chemicals picrocrocin and safranal.It also contains a carotenoid dye, crocin, which imparts a rich golden-yellow hue to dishes and textiles. Its recorded history is attested in a 7th-century BC Assyrian botanical treatise compiled under Ashurbanipal, and it has been traded and used for over four millennia. Iran now accounts for the lion's share, or around 90%, of world production. Research into its many possible medicinal benefits, ranging from cancer suppression to mood improvement and appetite reduction, is ongoing. ...that Qutb al-Din al-Shirazi gave the first accurate explanation for the formation of a rainbow? ...that family registers are known as Koseki in Japan? ...that the first head of the House of Saud was Muhammad bin Saud? ...that Fataluku is a language commonly used on the eastern part of East Timor? ...that Guozijian was the national central institute of learning in Chinese dynasties after the Sui Dynasty? ...that one of the first specimens of homo erectus, dubbed Peking Man, was found in a cave system called Zhoukoudian near Beijing in China? ...that the Shivneri Fort near Pune, a city in the Indian state of Maharashtra, was the birthplace of Shivaji, founder of the Maratha Empire? ...that the Israeli agora was first used in 1960 and has recently been a significant subject of controversy in the Middle East? ...that Kuchum was the last khan of the Siberian Khanate, one of the four separate Khanates after the Golden Horde broke up? ...that Alam Ara (The Light of the World), a 1931 film directed by Ardeshir Irani, was the first Indian film with sound?